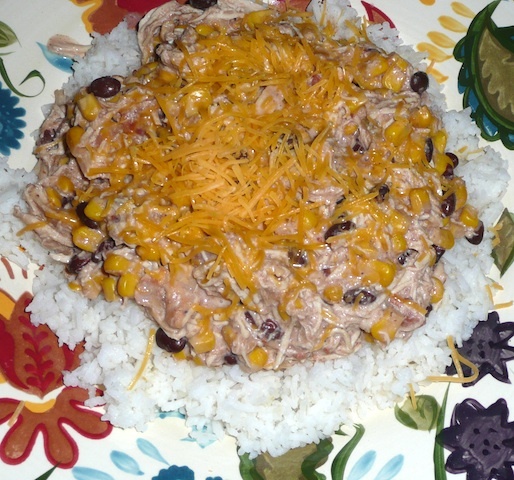 Tonight’s meal is one of my favorite slow cooker recipe discoveries. Since landing on these shores it’s only in the last 8 months or so that I’ve rekindled my flirtations with slow cooking. I’ve always been a fan of the slow cooker (or crock-pot, as it’s called over here) but in my younger days I naïvely followed any given recipe to the letter, which often meant several hours of preparation work searing or pan frying meat, sautéing vegetables and creating sauces before ever getting round to actually turning the darn slow cooker on. Nowadays, I’m a firm believer in the “chuck everything in at once” approach to slow cooking, mainly because I can’t tell the difference between the laborious way of doing it and the simplistic way. Frankly, if I have spend an hour or so in pre-cooking the food before it goes in the slow cooker then I might as well have cooked the darn thing on the stove or in the oven. So, todays recipe is for Santa Fe Chicken. I discovered this simply by searching on the net on various slow cooker specific recipe sites. I’m currently in the process of creating a data base of these recipes that I discover on the web simply because I have a terrible memory and can never remember the name of a recipe and have forgotten the ingredients that go into it. 1. In a 3.5 or 4 quart slow cooker, mix together the beans, corn, and 1/2 cup of salsa. Top with the chicken breasts, then pour the remaining salsa over the chicken. 2. Cover and cook on the HIGH heat setting 2.5 to 3 hours or LOW for 4 to 6 hours. 3. Remove the chicken and cut into bite sized pieces or shred. Add back to the slow cooker. 4. Add the cream cheese (cut into cubes to melt faster), and turn slow cooker to high heat. Heat until cream cheese melts and blends into sauce. 5. Serve over rice. Top with shredded cheese. This literally takes 10 minutes to prepare, unless you need to trim the chicken of any excess fat or those yucky white stringy bits. It serves at least four depending on how greedy you are at the dinner table! For us it makes enough for two days and is very easily reheated in the microwave.